Storage Based Policy Management (SBPM) has been around for a while, when working with storage tiers, metro clusters, or vSAN, it’s either fundamental or best practice. But clicking on anything more than half a dozen vms and datastores is a bit too much hard work. Using a mix of PowerCLI and the web client I can save a ton of clicking without making things to complicated. I’m going to create and assign tags to datastores bases on their location (or tier), create a policy and use a rule to automatically assign the policy to any datastore with a specific tag. After this I will assign to virtual machines tags ( this is optional) and the storage policy. This will allow me to see from the Web client if vms are on the correct datastore. 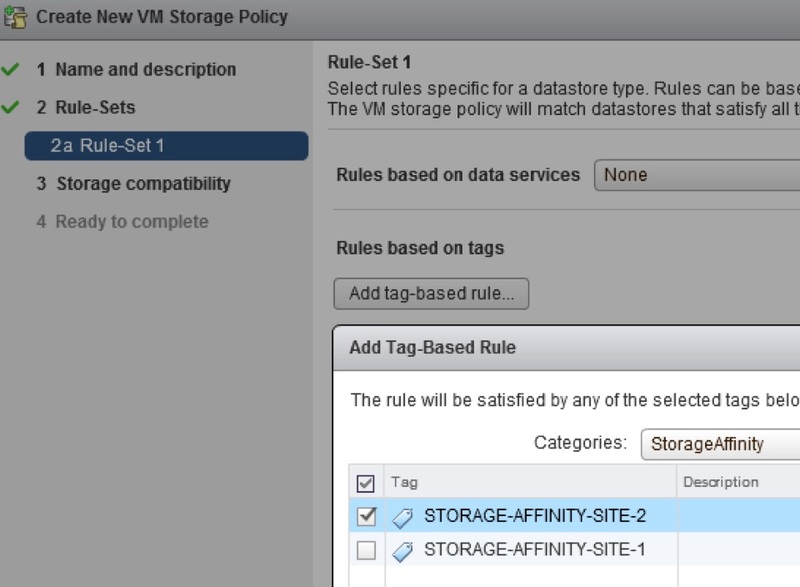 With storage polices a tag based rule will automatically apply a policy based on a tag, just think of this a descriptive meta data. If you want to look at all vms in the Datacenter then reload the $vms variable with all the vms (ie: $vms = Get-vm) then run the Get-SpbmEntityConfiguration line again. I’ve created a couple of powercli scripts that can be used to filter vms by tag and then see the policy and compliance level, or to simple check policy and compliance on all vms.